Sydney Shop Girl: Thursdays That Feel Like Fridays. See You Next Week. Thursdays That Feel Like Fridays. See You Next Week. It's the last night at home before the SSG long weekend in Singers. So I'm carrying on like it's Friday night. Take away for dinner. The Byron Bay pizza from our local pizza parlour. There were prawns, there was bacon, there was cheese. It was G-O-O-D. I have to admit, I chose the Byron Bay in honour of Kerry O'Brien. He made the cover of Sydney magazine. In my haste to get home early and pack, I left the magazine at work. Kerry is semi retiring to Byron when he finishes hosting the 7.30 Report in December. Hard hitting current affairs on our national broadcaster is never going to be the same again. Lunches to take to work next week are sorted. I'm regressing to the foods of early career girl years .... Lean Cuisines. I'll let you know if they taste any better than they did the first time round. 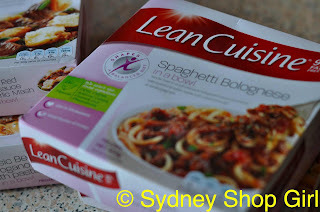 Ah Lean Cuisines, they got me through many a cycle of 4 days, 4 nights and 4 off. Those and 600 ml Diet Cokes (I did nights before Coke Zero was invented). Then I learned to cook and got a root canal. It was good bye Lean Cuisine and Diet Coke, respectively. In between episodes of The Good Wife and Rake, I've managed to pack my suitcase. Mr SSG and I have been workshopping outfits. Or rather Mr SSG has found shirts and ties that go with my chosen dresses. Team work. I love it. 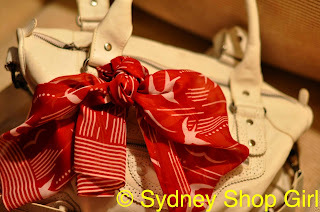 Scarf - Sportsgirl, bag - Witchery. Oh, that's my red scarf from Sportsgirl. It's been a while since I've bought anything from them. It's my 'I'm like a bird' scarf - or the Nelly Furtado. That was a pretty random reference. Only on a Thursday that feels like a Friday. So, good night, all. Have a lovely weekend and I'll catch up with you next week. 2 days in Singapore is barely enough. I like your nelly furtado reference! Looking forward to hearing about your holiday in Singapore. Love how we get to travel vicariously through blogs! Secrets, no lies! http://bit.ly/i07W3T xo Spill, I just tagged you darling girl! Hope you are having/have had a fab few days in Singapore. Mum suggested we go there for a week over Christmas/NY so I am eagerly awaiting your posts when you return! Hope you found some Hello Kitty to add to your collection. Now I feel like pizza! I hope you had a fantastic time in Singapore!